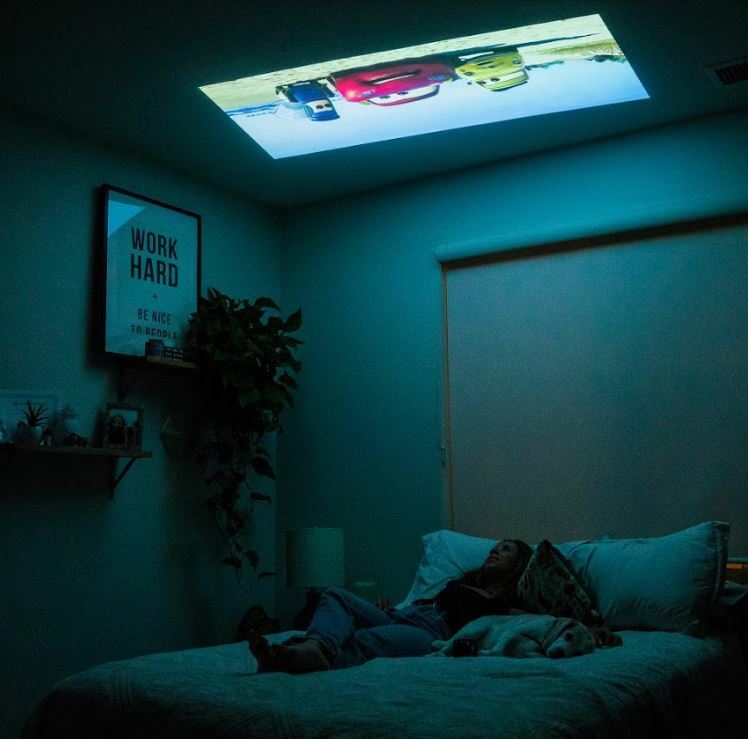 Portable projectors have made leaps and bounds on their predecessors from just a few years ago. 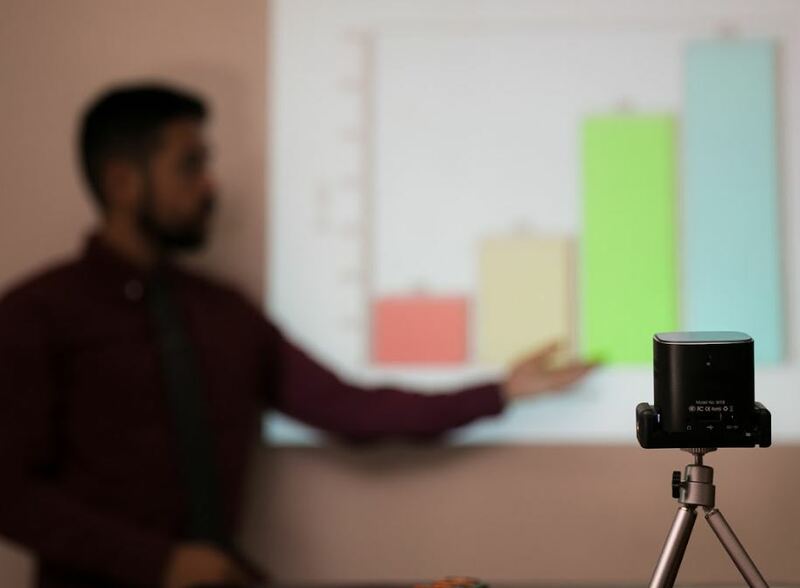 With the constant evolution of this technology, clunky, cumbersome projectors are now becoming a thing of the past. Especially thanks to innovative and successful crowd-funding campaigns have shaken the industry from top to bottom. Take the PIQO Pocket Projector for example. 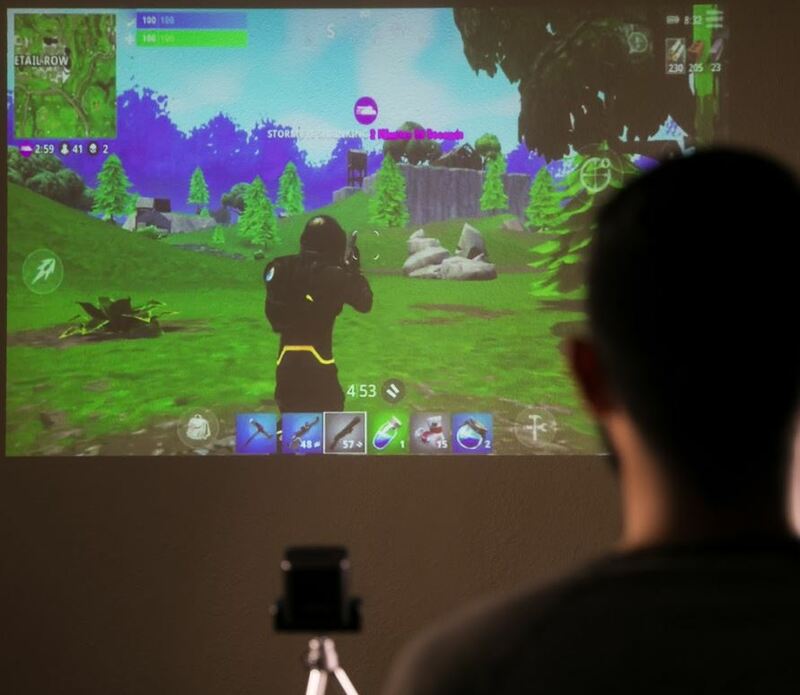 Launched on IndieGoGo earlier this month, PIQO is already being credited as the “World’s Most Powerful 1080p Pocket Projector”. With over 3200 backers and still a week to go, it seems like most people would agree. Today we’re going to take a closer look at what it has to offer, which features impress us the most, and what’s lacking. By taking one quick glance at the PIQO, you’ll notice that it’s definitely built to impress. It seems as if every feature was thoughtfully selected to outperform nearly every other portable projector in its class. 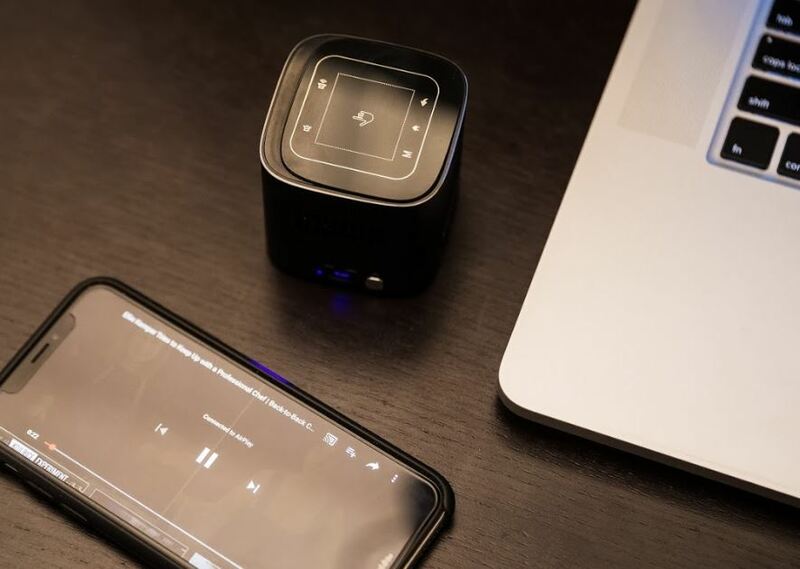 Described as a 2″ cube with a 240″ projection capability, it’s main purpose is to let you stream virtually anything you could possibly want from all your devices, anywhere, anytime. Seeing it for the first time, you may not expect so much to come from such a small size. It’s appearance represents a “pico projector” (hence the name), but it offers much more than your typical pico. 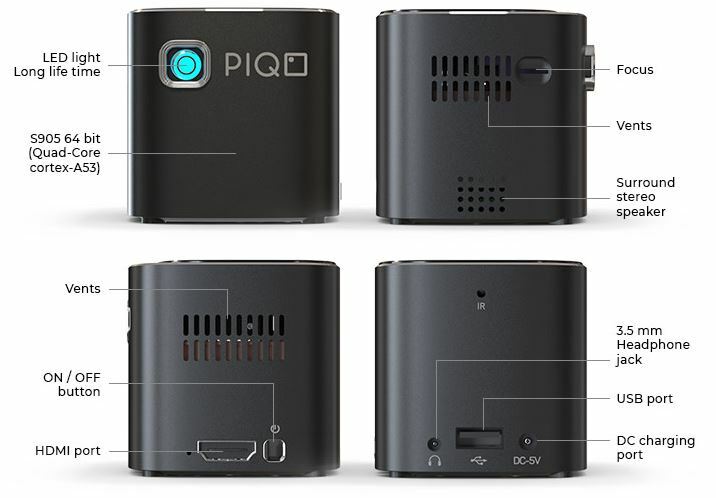 While a typical pico projector is simply a portable projector (capable of displaying up to 100 inches) that’s designed for smartphones or tablets, the PIQO boasts much more. What sets it apart is its universal compatibility, massive 240″ projection size, offline capabilities, sound quality and ease of use. Let’s get right into it. 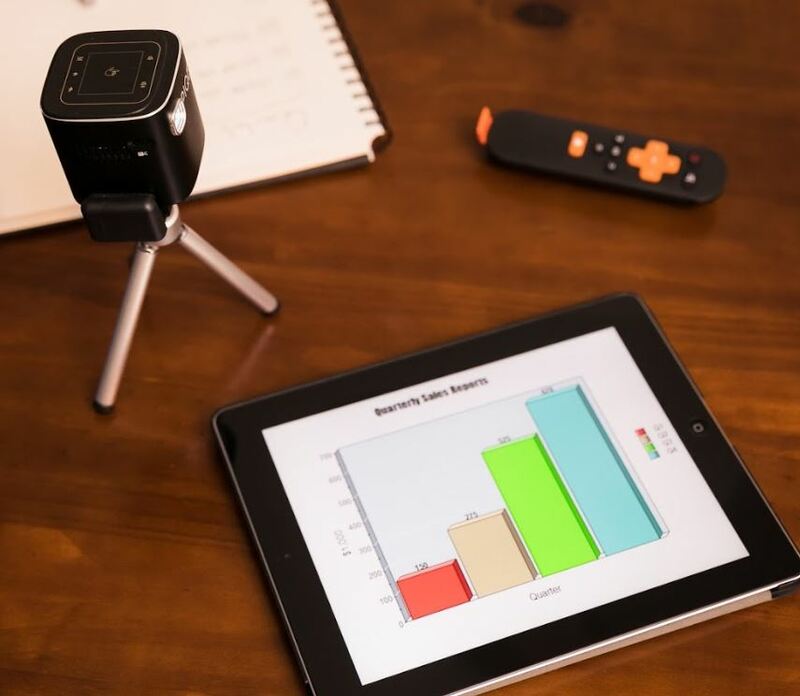 Measuring just 2.25″ x 2.25″ x 2.25″, the PIQO Mini HD Projector is a tiny black cube with something to know about on all sides. Located on the top is a small touchscreen interface that enables seamless navigation to access all the functionality with a single finger. There’s sound adjustment (volume controls), a home button, back button and a “line up to menu” button. On the rear, there’s a USB port, DC charging port and a 3.5mm auxiliary headphone jack. Moving to the left side, you’ll notice an HDMI port, on/off power button and a ventilation hole. Located on the right side, you’ll see the integrated speaker grille, another ventilation hole and a focus dial for manually adjusting the picture to perfection. With an estimated battery time of roughly 5 hours, you’ll easily be able to watch one or even two full movies without the need to plug-in external power. The integrated battery opens up a world of portability that standard projectors simply can’t compete with. With a 10 minute charge via the DC input on the back of the PIQO, you’ll have about 60 minutes of video play before you need to charge it up again. In this case, an hour-long charge will provide the maximum ~5 hour playtime. Charge times like this aren’t something you see standard in portable projectors. Additionally, if you’d like to use PIQO to exclusively listen to music with (while not projecting), the estimated battery life can reach up to 50 hours! While this isn’t something we’d think most individuals would typically do, it’s nice to know it’s fully possible! While the maximum screen size that PIQO is capable of projecting is 240 inches diagonally, you may find that a smaller screen size is preferred or more ideal for your specific scenario. Adjusting the screen size is as simple as moving the projector a bit closer or further away from the wall or screen that you’d like to display the image on. But screen size truly isn’t everything. Another aspect of the display quality that should be taken into consideration is the brightness. Boasting 200 ANSI lumens, PIQO is twice as bright as most projectors in its class. This directly correlates a clearer, better contrasted, more vibrant picture that displays better in brighter environments that aren’t typically well-suited for projector use. You can display in both night time or day time environments, but we must say – a dark room is definitely the way to go! It’s not impossible to view in a bright room, but you’ll have a much better viewing experience if you dim the lights and roll down the curtains. One important factor with any projector available is the keystone correction. What exactly is keystone? When a projector is placed at an angle other than perpendicular, the display may be skewed in one orientation or the other. The top of the picture may be wider than the bottom and vice-versa. Luckily, automatic keystone adjustment was included with PIQO so you’ll never have to worry about setting up the right adjustments for the perfect angle. Internally, there’s a variety of gravity sensors that automatically adjust the projection angle for a perfect picture. Awesome! Moving forward, PIQO is designed as a 1080p projector that can display full high definition quality from virtually any source. This resolution in conjunction with the 200 ANSI brightness and the automatic keystone adjustment makes for a fantastic viewing experience. While it’s not the ridiculous 4K or 8K resolution that you’ll find at CES with the latest OLED televisions, 1080p is still great! However, there is one small qualm that’s worth discussing. PIQO is not yet compatible with 1080p HD streams from Netflix or Amazon Prime. To be compatible, the device must have a Widevine L1 certificate and unfortunately, PIQO does not carry this certification. This isn’t to say that you can’t watch Netflix or Prime through it – you just won’t be able to watch their offerings in full 1080p high definition. But don’t worry quite yet. This is something that we could see coming out with an update or when the product is fully released after the IndieGoGo Campaign reaches fruition. There’s some talk in the comments section of the campaign that discusses this, so we know it’s something that they’re actively working on remedying. While visual quality is something that we all know is important, audio quality can often be overlooked. With a built-in speaker, PIQO’s acoustics were engineered by Bose and Harmon Kardon engineers to emit crisp, quality tones without distortion or fuzziness. The sound seems to be loud enough to keep things interesting, but not on the level of a fully immersed 5.1 channel sound system with a subwoofer. After all, the small stature of the projector is only capable of so much. But for its size, we couldn’t see anyone complaining too much about the audio quality. In the event that you’re not happy with the integrated speaker, you can easily (at anytime) plug in external speakers without much effort. Additionally, you can even pair any Bluetooth speaker for wireless and/or improved audio on the go. This is something that truly sets the PIQO projector apart from the rest. In all the years we’ve been discussing tech-related products here on NerdTechy, we’ve never seen a portable projector with the amount of compatibility options as this. Virtually any device from any operating system or connection method works well with PIQO. Laptops, desktop computers, smartphones and tablets or any Windows, Mac (iOS) and Android powered devices can connect within seconds. A connection can be established whether it be physically or wirelessly. Plug and play operation allows you to simply plug in a USB flash drive or HDMI cable and instantly enjoy content through the projector. However, you can also utilize AirPlay, Bluetooth or Screen Mirroring to wirelessly pair your preferred device with the projector. Whichever option you choose, a connection can be had within 20-30 seconds or less. Last but not least, since it’s powered by Android 7 Nougat, you’re given access to over 3 million applications on the Google Play Store. The virtually endless amounts of games and entertainment that you can link to is purely awesome! Navigation and searching for everything you can think of is a piece of cake. While PIQO connects via WiFi for wireless streaming, we all know that the portability of it will likely make you want to bring the projector where WiFi isn’t. Taking it outdoors, camping or on the road, you may not have the luxury of connecting to the Internet whenever you’d like. This is why they’ve included 16 GB of internal memory for storing content that you want to play “on the go”. This opens up a realm of options for the end-user by letting them download their content via Netflix, YouTube or other services to keep with the projector at all times. In addition, you can utilize the USB port to connect massive amounts of external storage via thumb drive or external hard drive. It’s nice to see that offline capabilities were added and not completely forgotten about like similar projectors in its class. Looking over the PIQO projector, you can tell that it has a lot going for it. So much so that it can actually seem like there isn’t a single thing wrong with it. While we agree that the founders and team of developers seemingly thought of everything and anything, there are two minor issues we see as potential drawbacks for some users. The first being the inability to stream HD content from Amazon Prime and Netflix. We covered this a bit in an earlier section, but it’s worth pointing out. Until the projector has a Widevine L1 certificate, users won’t be able to stream in full 1080p clarity through these channels. We see it as something that they’re working out in the future, and it could be as easy as a simple firmware upgrade when the time comes. In fact, as of just 12 hours ago, we’ve read comments on the campaign that address this issue. In the meantime, utilizing the screen mirroring feature might be an easy work-around for this. One other small downside that some may gripe about is the lack of 4K support. 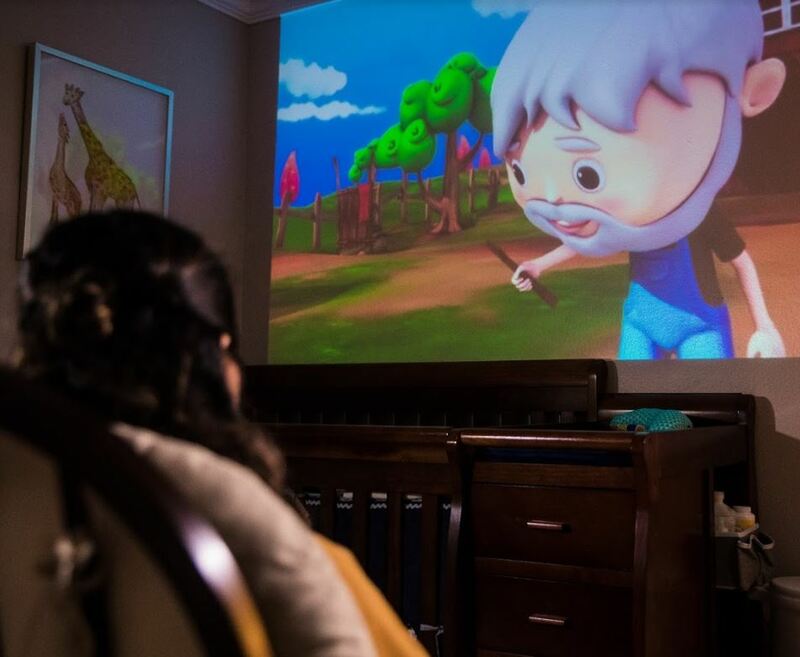 While we don’t personally think this is much of an issue, some users in this day and age are only looking for projectors that are capable of 4K Ultra HD. In reality, there are no portable projectors that support 4K yet – it still might be 3-4 years before we see these hit the market. Like we said, not truly a downside, but worth noting. 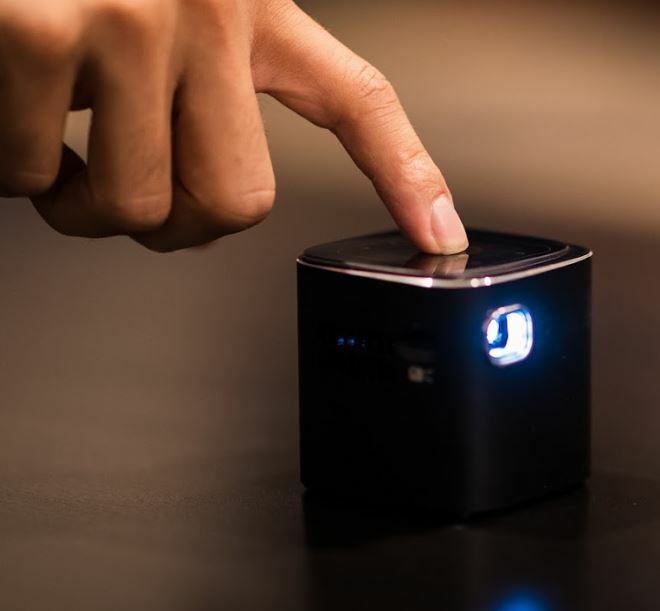 All in all, we agree that the PIQO Pocket Projector is something definitely worth considering if you’re in the market for a state of the art mini projector that’s full of high-end features. It may be small, but the capabilities of it will provide seemingly endless amounts of entertainment whether you’re on the go or in the comfort of your own home or office. We’re in love with the compatibility and its use with devices from a wide range of platforms. From your smartphone, laptop, thumb drive, tablet or even utilizing the internal memory, you can enjoy up to 5 hours of 1080p HD video without hiccups. 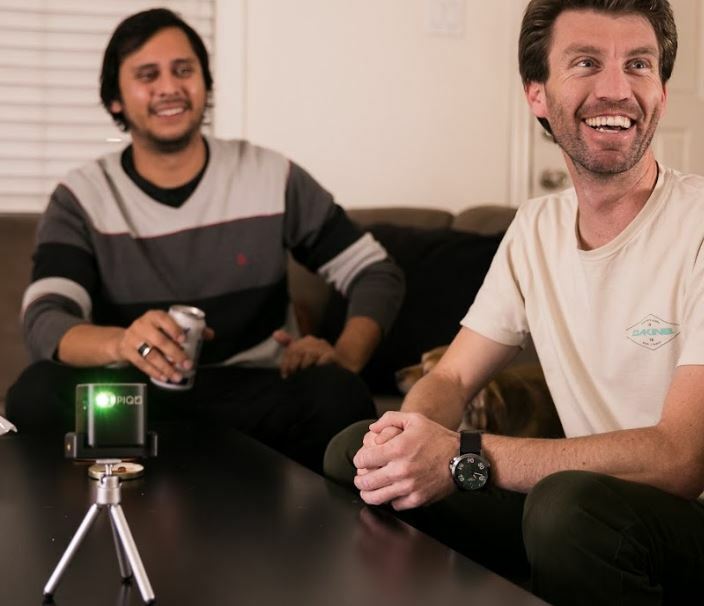 Great sound quality, easy usage and unmatched portability, it’s easy to see why this is one of the “top picks” on the entire IndieGoGo platform for the 2019 year. 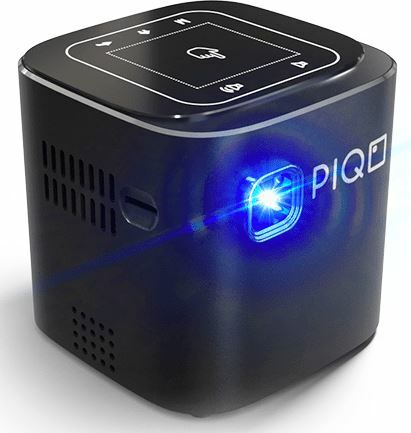 What’s your opinion on the PIQO Pocket Projector? Are you already a backer? Thinking about purchasing it? We’d love to hear from you with your opinions, questions or concerns. Drop a comment below!